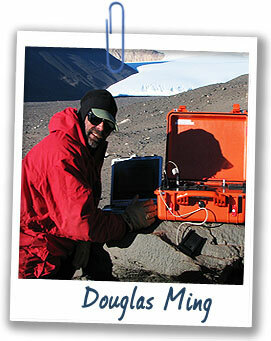 Doug Ming is a planetary scientist who works for NASA. He dreams of the day when we grow plants on the Moon and Mars! Great! In an experiment at the Johnson Space Center, we planted ten different crops including lettuce and tomatoes in soils identical to lunar and Martian soils. We had to add critical nutrients like nitrogen, but everything grew. The enriched lunar and Martian soils did as well as a simple potting mix. Did you eat the produce? Well, it was a research project, so we studied the plants, but occasionally we’d eat them. What are the big differences between the soils on Earth, the Moon, and Mars? The number one thing is that soils on Earth are the result of enormous biological activity that shaped them. There’s no biological activity on the Moon and Mars. The difference between the two is that Mars has had liquid water. The moon is bone dry—that’s not good for life.